Online Absolute Shope Estate Auction — Harritt Group, Inc.
10% down payment due within 24 hours, balance due within 40 days. Taxes prorated to day of closing. Possession at closing. Selling as is, all inspections welcomed prior to auction. 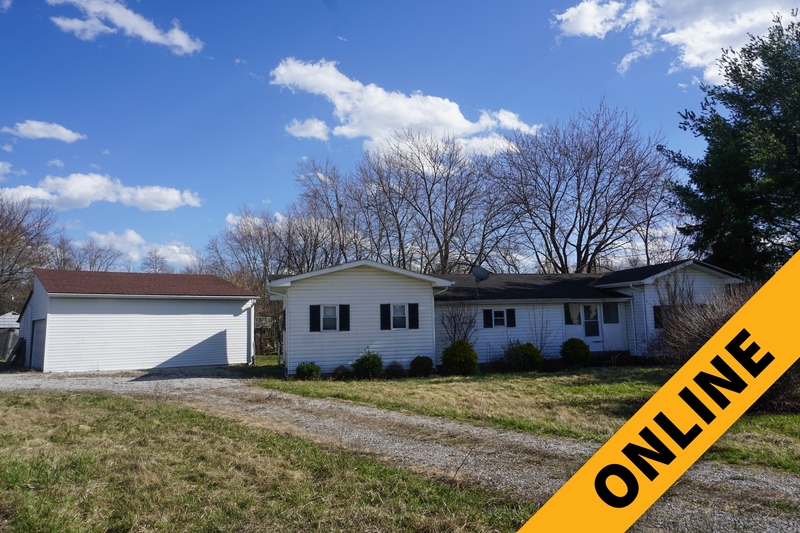 One level 1244 square foot home with large detached garage on 1/2 acre lot in an area of new residential growth just 2 miles East of I-65 Veterans Parkway in Jeffersonville, IN. Selling online with no minimum to the highest bidder! Great opportunity to own your new home or next rental property in Clark County at your price. Register at harrittgroup.com. Renovated 1244 square foot manufactured home with additions plus 2 enclosed porches, wood deck and large detached garage on 1/2 acre located in Clark County near Holman Lane just East of I-65 and minutes to IN-62. This one level home features 2 bedrooms, 1 1/2 baths, and spacious laundry room, updated kitchen, large dining area, office, living room, enclosed porch with half-door plus wood deck situated on appx. 124’ x 190’ lot. A large 28’x36’ detached 2-car garage with an electric door ready for vehicles while the other side has a wood stove perfect for hobbies or storing lawn equipment. A great location easily accessible to restaurants and shopping and in an area of recent residential growth next to patio homes and single-family homes. Sells online with no minimum to the highest bidder! GREATER CLARK COUNTY SCHOOL CORP.
I-65 to Veterans Parkway Exit #5. East 1.7 miles, crossover Holman Lane, continue straight 3/10 mile on Charlestown Pike to property on right. Located between Lindy Trail and Alannah Gardens Court and across from Meadows Armstrong Farms.